I have a rather unique ability. I have the power to potentially alter your behaviour and perception of others by simply showing you a list of words. Impressed? Don’t be. In actuality I am simply applying a psychological technique called priming. Academically, priming is defined as “the process by which recent experiences increase the accessibility of a schema, trait, or concept.” Sounds confusing, but in reality it is very simple to understand. Imagine if I were to provide you with words like rude, intrude, and disturb to unscramble and then ask you to come get me when you were done. Upon completion of the task, you find me but notice I am having a conversation with a colleague. Would you immediately interrupt me or wait a few seconds? What if the words were patiently, appreciate, and polite? Would that alter your behaviour? Surprisingly, in a study performed by John Bargh and his associates, participants primed with aggressive and rude words overwhelmingly interrupted the conversation faster than people primed with either neutral or calmer words. This is just one example from Social Psychology that demonstrates how our actions and thinking can be skewed based on how we are primed prior to encountering an event. There are several situations that can result from different combinations of positive or negative priming. Management Positive Primed: Trying to impress Management by informing them the innovative challenge will be easy counter intuitively produces a negative outcome as there will be limited funding and personnel. Management Negatively Primed: This produces a positive result, as Management will now think the task is rather challenging and in order to successfully complete it, will provide extra funding and personnel. 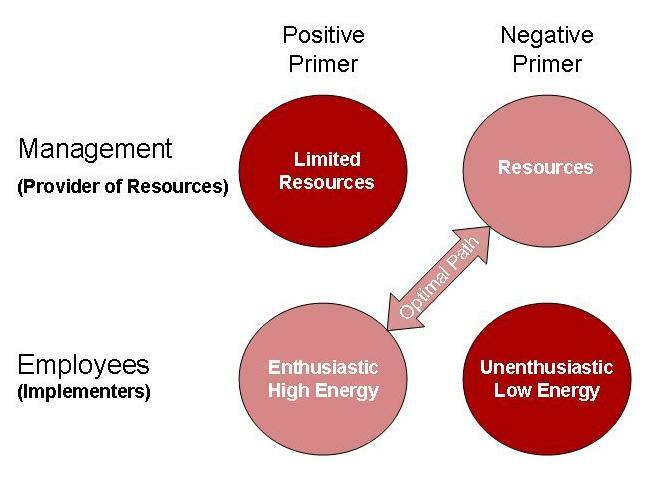 Employees Positively Primed or Negative primed produces the results we would expect. Telling Employees they have been selectively chosen for the challenge due to their skill level and creativity will obviously produce a group that is very motivated and enthusiastic to take on the challenge. As one can easily guess, the opposite will occur if Employees are told the challenge will be rather difficult, many problems will be encountered along the way, and they were randomly selected. Clearly there appears to be a combination that is optimal for an innovative environment: more resources are provided and the employees are very enthusiastic. This lies in priming management in a negative way and priming Employees in a positive way. As mentioned, this paradoxically should result in a situation where funding and/or additional resources are provided to an eager bunch of innovative employees waiting to take on the challenge. Imagine if all your problems were approached in this way! There is also a situation that should be avoided. If management is positively primed, and Employees are negatively primed, low levels of resource and funding will be provided and you will end up with a bunch of Employees who do not want to take on the innovative challenge. It can be agreed upon how either of the remaining two combinations (e.g. 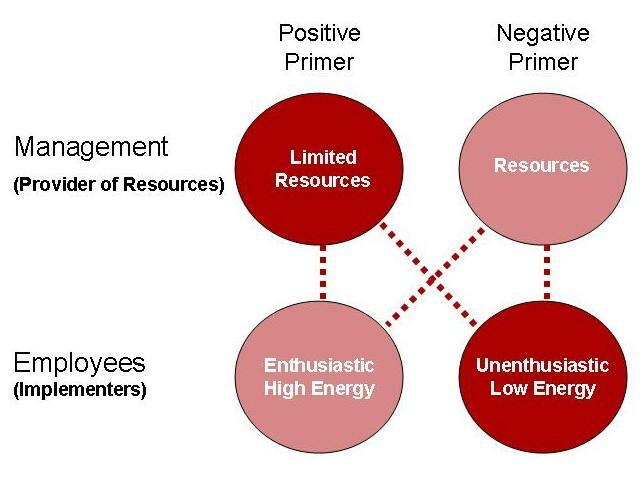 positive primer to both Management and Employees/negative primer to both Management and Employees) is what a typical company usually faces when an innovation challenge is encountered. Either there will be excited management ready to give money, time, etc to unmotivated and overworked employees, or very excited employees who want to work on a particular challenge will be told they have very strict limitations. 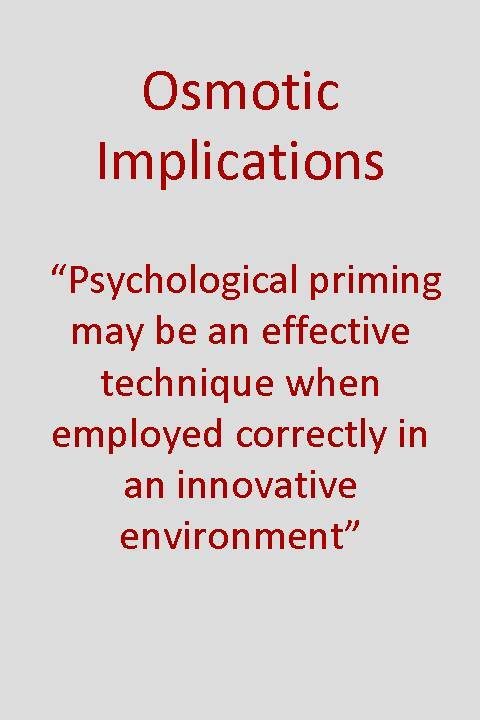 However, as demonstrated above, perhaps utilizing psychological priming may decrease this tendency and help to promote a more positive innovative culture. Bargh, J., Chen, M., & Burrows, L. (1996). Automaticity of social behavior: Direct effects of trait construct and stereotype priming on action. Journal of Personality and Social Psychology, 71, 230-244. This entry was posted in Innovation challenges, Thinking and tagged innovation session, Management, Priming, teams.